It seems that the human race has always had a need to sweeten the food we eat and for centuries, although sugar was imported into England from at least the 16th.century, this was achieved, for most people, by using honey which was produced within the country's own shores. With the founding of the West Indian sugar plantations c1642 (Barbados had been settled in 1626), however, sugar soon became the preferred agent for sweetening all sorts of food and by the end of the 17th century, when the tonnage of sugar imported had risen from less than 800 tons a year in 1665 to 10,000 tons (note 1) it was not only being put into food, and used to make all sorts of confections and cordials, but was being shaken over it as well. To accommodate this particular use of sugar a suitable vessel for dispensing it in this way was required. Sugar had always been kept in sugar boxes which were the Elizabethan forerunners of the bowls, baskets and vases of the 18th century and although pepper was sometimes kept in the small detachable top of the bell salt, casters, as such, did not appear until after the "Restoration". When they did appear they were for "casting" sugar not pepper. I have read of Charles II casters but have only ever seen a photograph of one. I feel that they must be very rare indeed. The earliest example one is likely to come across is of the William III period, and these are very few and far between. They were usually quite large and simple in construction being nothing more than a cylinder standing on a small foot rim. The detachable pierced top is secured by means of a bayonet fitting and is surmounted by a cast finial which is usually of the baluster type. The method of manufacture appears to have been to fold a sheet of silver round to form the cylinder and then seam the ends together so that it may be possible to detect this seam, if not on the outside then on the inside. These casters are known as Lighthouse casters. It seems that subsequent patterns of caster were not made in this way. The body is usually undecorated save for armorials although the tops and foot rims are often given some decorative ropework feature; foot rims can also be pierced. They are fully marked just below the joint of top and body and the tops should be marked with the maker's mark and the sterling lion or lion's head erased. The piercing is fretted out by hand and consists of rather large apertures which are simple and not terribly decorative. It is interesting to note that hallmarking of this period was looked on as a legal necessity but no other importance was attached to it as it is today. It seems that objects which were destined for the piercer were sent up for marking before piercing took place and no care was taken by the piercer to avoid the marks which had been put on at "Hall" so that often these marks were cut through. The sterling lion, the only mark on the top of the lighthouse caster illustrated here, has been so treated and only the front half of this mark is now discernible! There is no reason why sugar of the day could not have been as fine as that which we are used to and it is therefore difficult to know why the apertures on casters are relatively large. Casters of this period are quite rare and difficult to come by so that an example with a bent finial must be considered acceptable. Although these casters were still being made at the beginning of the 18th century the simple piercing of a lighthouse caster will date it to the 17th since, conveniently, piercing became more complicated during the reign of Queen Anne. 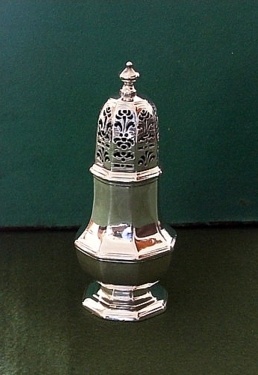 The Queen Anne caster, which, like other Queen Anne hollow-ware, is portly in appearance (there are Queen Anne lighthouse casters) did not evolve from its forerunner, as future casters did from theirs, and the only thing to relate it to the lighthouse caster is the method of securing the top. At the beginning of the reign it too had bayonet fittings but by the end of the reign the top was just a push fit and this method of securing the tops of casters remained unchanged throughout the century. The only other change which took place during the life of this particular caster was that the early ones were marked, like the lighthouse variety, on the body just below the joint of top and body whereas the later ones were marked underneath. One feature which is peculiar to these casters, however, is that the top is constructed, as if in two parts, with a strengthening band running horizontally round its middle. This feature is peculiar to this caster and does not appear on the lighthouse variety or on those which come after the reign of Queen Anne. The piercing is still rather large, is hand fretted and, being somewhat more ambitious in concept than that of the earlier examples, can be quite decorative. The shape of these casters is usually known as pyriform and it can easily be seen how the next shape evolved from it. 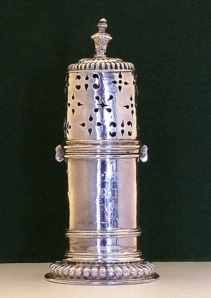 The top of the Queen Anne caster is marked on the sleeve which pushes into the body of the vessel and secures it although the earliest have bayonet fittings. This method of marking tops was common to all casters throughout the 18th century. By the reign of Geo I the neck of the caster was becoming elongated and the body was raised slightly on a domed foot so that the whole thing presented a much more elegant appearance. This design is known as the vase shape and persisted throughout the reign of Geo II and into that of Geo III. One variation which is peculiar to Geo I casters, almost exclusively, is that they are usually octagonal in form. The piercing of the top is now much more complicated and commensurately more decorative. Otherwise they are much like their precursors in that they are, on the whole, undecorated except for armorials and are fully marked underneath with the tops being marked at least with the sterling lion and / or the maker's mark. Although baluster finials were common throughout the 18th century those of the queen Anne and George I periods can take the form of a ball with a pip at the top which I have described as "bun and knop". Finials of this design are peculiar to the beginning of the century. By the second half of the century acorn and flame finials had made their appearance but were not as common as the baluster type. An even less common design is the pineapple but examples can be found. 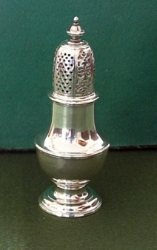 By the end of the 18th century a simple ball finial had been introduced and this can be found on both the conventional caster and on those being made of glass as well as on some other small hollow-ware. 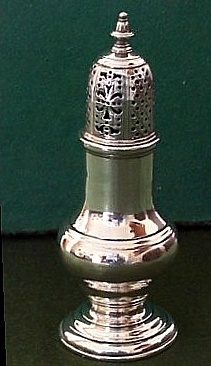 In the same way that the bun and knop finial is common only at the beginning of the 18th Century the ball finial is found mostly at its end. I have seen a ball on a sort of collared neck on a caster of 1745 but this is quite unusual. Conveniently the pyriform design more or less coincided with the reign of Queen Anne and the octagonal vase shape with that of Geo I ( the earliest octagonal I have seen is dated 1713 ) but, whilst the vase shape persisted throughout the reign of Geo II and into that of Geo III, the octagonal appearance disappeared at about the beginning of the reign of Geo II. The finials on Geo II casters were commonly of the baluster shape and the piercing took on a new appearance. It took the form of alternating vertical bands of ornate piercing of the type used in the Geo I version and rows of simple holes punched through an engraved diaper background. It is convenient that this arrangement of alternating bands of piercing coincides, more or less, with the beginning of the reign of Geo II and persisted well into that of Geo III and so can help when dating a caster although it must be said that some casters were still being produced during this period with only the decorative piercing common to earlier examples and some, even, with nothing but simple holes. It seems likely that either the piercing was carried out by specialists in the field, the belief most widely held, or that standard pattern books of the day were used since almost all casters of this period exhibit this design feature no matter who the maker was. My own belief is that there were craftsmen specialising in this piercing work and that they used each other's pattern books (note 3). Another innovation at this time (the earliest I have seen was dated 1726) was the introduction of the blind caster. One of the pair of pepper casters would have a sleeve inserted behind the piercing so that it was, in effect, not a caster at all. Most authorities are of the opinion that such "casters" were designed to contain dry mustard and it is true that at about the time that these "casters" came into use the condiment spoon, which would have been needed to dispense the contents, made its appearance. These little long handled spoons are not common! There is a record of such a spoon by an unidentified maker "FG" found together with a blind caster also by "FG" and this supports the theory that, whatever blind casters were made to contain, a suitable spoon was needed with them. As there is no record to suggest that pepper was no longer used one must assume that the habit of using mustard in this way superseded the use of cayenne. To support the view that these blind casters were for mustard it must be observed that their production stopped at about the time that the mustard pot came on the scene. The collector is, in fact, more likely to come across the half blind caster in which the sleeve is itself pierced but in such a way as to restrict considerably the flow of the contents or alternatively is designed to cover only some of the piercing. It is true that the sleeving of such casters can be contemporaneous but I feel that it is possible that in some cases these casters were adapted in this way at a later date to make them more useful when a finer grind of pepper became common. My reason for this view is that there are casters of the period which were made �blind� with the pattern of the piercing engraved onto the top to match its pierced partner and this suggests that any adaptation of an ordinary caster must be of a later date. It is a fact that the largest, sugar, caster in a set of three was not treated in this way. As with earlier casters these sometimes are decorated with armorials but are unlikely to carry any other decoration. They are fully marked under the foot and the tops are marked with a variety of the marks found under the foot but never with the leopard head. In connection with marking it appears that only one set of punches was used for marking both top and body so that the sterling lion stamped on the top will usually be of the same size and appearance as the one under the foot as will any other marks used. This is not universally true of all plate. The next pattern of caster manufacture follows quite naturally from the vase shape. The neck of the vessel joins the body in a less abrupt way than in the vase shape and is now less a neck and more part of the body. This body portion is now shaped as if to give it an underbelly which in turn gives way to a domed foot. This design of caster is known as baluster and persisted well into the last quarter of the century. Marking, decoration and piercing are as for the vase shaped caster and the finials in both cases are most often of baluster form. There was one further development affecting the baluster caster and this became apparent towards the end of the 18th century. Casters were by now being almost mass produced and their quality suffered. 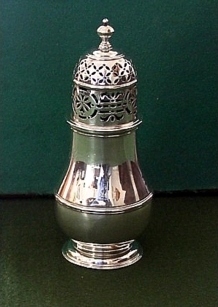 The silver used in their making was thin and lightweight. This necessitated a much larger foot to give it some stability and the "stem"� between body and foot became appreciably longer forming a pedestal. The piercing of the top consists of simple holes with no attempt at decorative work. These holes are still drilled through a diaper background but on the example shown here no attempt has been made to line up the holes with the diaper work and even the finial is just a simple acorn shape. These casters are undecorated and are now marked on the body again just below the joint of body and top. The marks will be in the order; Lion, Leopard, Date, Duty. As with all other casters made later than 1713 the marks appearing on the top are always on the sleeve which pushes into the body and it is surprising, given the number of times they have been thus rubbed during their lifetimes, that they still survive. Better quality casters were still made during this period but they are not as common as the cheaper variety. Incidentally the one illustrated here came out of the Hester Bateman workshop and shows that her work is not always of the highest quality and certainly not worth paying a high price for. By the end of the century classical design had had its affect on casters and they became urn shaped. The top is still only perforated by simple holes but with this design of caster the top takes on a double bulbous appearance rather than a straightforward dome and although the baluster finial persisted the ball finial mentioned earlier can be found on these casters. As this classical design only appeared at the end of the 18th century it persisted into the 19th. The progressive design of casters really came to an end with this classical design and the 19th century saw the evolution of the cruet set and the introduction of novelty casters of all shapes and sizes. 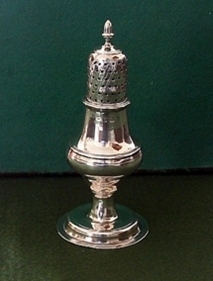 Sugar casters, which became glass vessels with silver or plated tops became divorced from the vessels made to contain pepper, and casters in sets of three ceased to be produced. 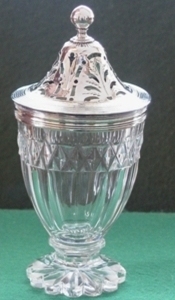 As with the bun pepper the top of the glass caster fitted over the neck of the vessel which was provided with a silver collar to accommodate this push fit. Both this collar and the bezel of the top which fitted over it should be marked in the same way. The fly press was used and the stub chosen was that used on tea tongs with the marks in the order Duty mark, Lion, Date. It has to be said that casters decreased in size during the 18th. century so that the Queen Anne caster by Charles Adam London 1713/14 made for sugar (see top page) holds 3oz. whereas the glass caster produced at the end of the century and also made for sugar only holds 1�oz. I am of the opinion that this has more to do with the increasing cost of producing casters than any change in the dietary habits of the people of the time or, indeed, the cost of sugar. It will be seen from the foregoing that the name caster, as used by collectors, refers to vessels produced toward the end of the 17th century and throughout the 18th and should therefore bear hall-marks of this period. Any earlier marked examples are fakes and are probably made from small tankards. In such cases, of course, the tops will be unmarked. Any later ones, allowing that the production of the urn shaped caster did spill over into the 19th century, are merely reproductions. Although the foregoing text and illustrations, with the exception of the 'Late 18th century Classical Style Caster', are taken from actual items of plate and are representative they are not definitive. Examples can be found, ornately decorated casters by de Lamerie for instance, which do not conform to these guidelines and they can, therefore, only be taken as a guide to what to expect when seeking to establish the development of these pieces of English social history. note 1 - Bernard & Therle Hughes - Three Centuries of English Domestic Silver Lutterworth Press 1952, p178.